There was no wind and the air was warm - it had been a perfect beach day - and it was hard to imagine that it was freezing cold up on Table Mountain and the Twelve Apostles mountain range. 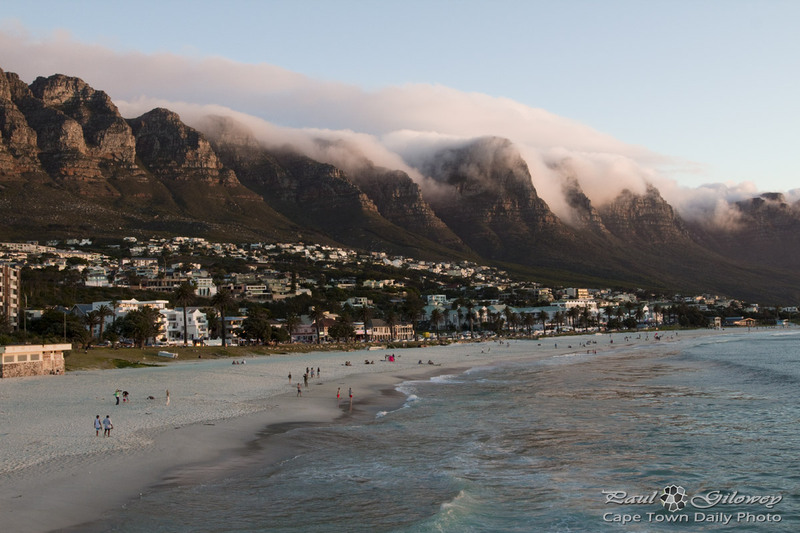 If you visit Cape Town, and if the weather's right, you'll see a similar blanket of cloud covering the mountain. The weird and enchanting thing about the clouds is that they continuously descend from the mountain towards the earth but never seem to reach it. They billow over, almost like you'd imagine a witch's cauldron would. It's quite enchanting. Posted in General and tagged camps bay, clouds, mountains, sea on Saturday, 19 October, 2013 by Paul.